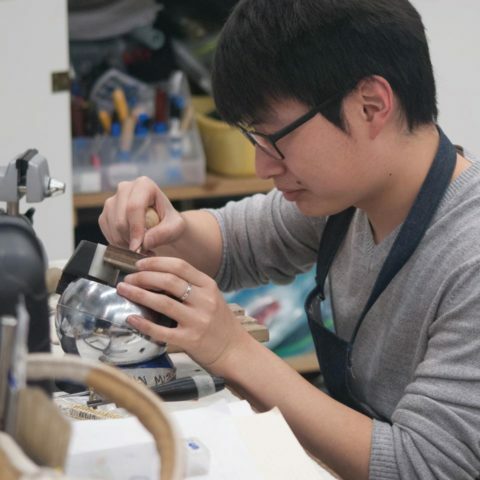 The Academy’s jewelry studios are designed to prepare you for a career in jewelry and the metal arts. Our hands-on learning environment creates a culture that supports curiosity, investigation, and production. Online students are also hands-on, as they engage in discussions and activities through the online platform, social media, and real-time streaming of our events. Both online and onsite environments are equipped to give you the skills you need to create the jewelry and metal arts career of your dreams. Graduate students working toward their final portfolio or final thesis are provided with a special shared studio space. You can work between or after classes in the studios, any time the building is open. You can learn a variety of metal fabrication processes and craft precision metal parts in our full-featured casting equipment, machine lathes, milling machines, disc grinders, rollers, and formers are all at your disposal.